An excellent and inspiring six-day meeting of the International Executive Committee (IEC) of the Committee for a Workers’ International (CWI) ended on 3 December. Attending were 90 CWI members and co-thinkers from over 35 countries, encompassing Europe, Latin America, Africa, Asia, Australia, Canada and the United States. The meeting discussed, amended and agreed documents on the world situation, Europe, the Middle East and Latin America. These are available on the CWI website: socialistworld.net. The IEC fully endorsed the political analysis of the Socialist Party in England and Wales on the major events in Britain of the last year - the developments in the Labour Party around Jeremy Corbyn, and the Brexit vote - and our positions and orientations throughout those fast moving changes. in support of Bernie Sanders in the US presidential election. They elaborated to the IEC on their activity since achieving the tremendous reelection of Kshama Sawant in 2015 to Seattle city council, and on how this year they launched Movement for Bernie (now ‘Movement for the 99%’) and organised some very successful ‘Marches for Bernie’. After Donald Trump’s victory, they acted extremely quickly in calling for immediate protests across the US, to which 40,000 people responded - a great start to building the necessary opposition to Trump’s racist, divisive, anti-worker agenda. Socialist Alternative has had its strongest year of growth yet, reaching nearly 1,000 members in over 30 branches covering 20 cities across the length and breadth of the US - fast becoming the most influential Trotskyist organisation in that vast country. They are planning a launch as a fully-fledged party in 2017 or early 2018, taking their work onto a strengthened, higher level. Particularly welcomed and applauded at the meeting were excellent contributions from two participating visitors from the Spanish organisation Revolutionary Left (Izquierda Revolucionaria - IR), Juan Ignacio Ramos and Victor Taibo. Victor reported on how young IR members, who lead the student union Sindicato de Estudiantes (SE), have recently been at the forefront of the magnificent mass student movement across Spain that has achieved a significant victory over the Spanish government (see ‘Spain: Government forced back by student union mobilisations’ at socialistparty.org.uk). Juan Ignacio explained the history of IR, which was launched in April of this year. Until then it was known throughout the workers’ and youth movement by the name of its paper, El Militante. Orginally, El Militante members were organised as a section of the CWI, but in 1992 the majority of them split to become a section of the International Marxist Tendency (IMT), led by Ted Grant. In 2010, El Militante, together with the majority of the IMT’s Mexican and Venezuelan sections, broke with the IMT due to political differences on a series of strategic political questions. These included the building of a revolutionary party and work in the mass organisations, the national question, the characterisation of the new period opened up by the economic crisis, the cult of personality in the leadership, and in defence of a proletarian and democratic internal regime in the party, as well as the programme and tactics of Marxists in the Venezuelan revolution. In recent months IR comrades initiated a process of discussion, debate and practical collaboration with the CWI, which has revealed great political agreement, as well as agreement on methods and tactics. This rapprochement is heading towards a hugely important qualitative advance for the genuine forces of Trotskyism internationally. IR is a growing revolutionary socialist organisation, producing a monthly newspaper, El Militante, plus a bimonthly in the Basque country, and a ‘Marxism Today’ theoretical journal. As well as young students, its membership includes many trade unionists who are building up significant influence in workplaces and among the left in the unions. It has numerous premises across the country and runs the biggest Marxist publishing company in the Spanish speaking world - the Frederick Engels Foundation. Discussions between IR (and its sister organisations in Mexico and Venezuela) and the CWI in Spain and internationally are ongoing, with a view to a historic unification during the course of 2017. Already, prior to the IEC, a number of IR representatives visited London in September to discuss with members of the CWI international secretariat and England and Wales executive committee; and then spoke at the England and Wales Socialism 2016 event in November. 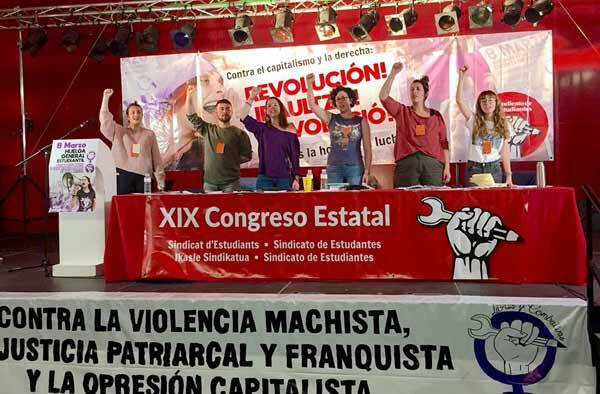 Later in November Peter Taaffe and Danny Byrne visited IR comrades and participated in a conference of the SE in Madrid, on behalf of the CWI, and plan a further visit to attend IR meetings in February. During the IEC discussion on these uplifting developments, CWI leaders from a number of countries commented on what a great impact a fusion would have internationally. For instance, Andreas Payiatsos from Greece spoke of the solidarity felt between working peoples across southern Europe, which means that cross links in their struggles and organisations are hugely important and they are boosted by eachothers’ successes. Andre Ferrari from Brazil spoke of how socialists in Brazil and across Latin America have closely followed material of the Marxist left in Spain. He praised the honesty of IR members in analysing the past, which - together with reciprocal openness and integrity in the CWI - has set an excellent example for discussions that the CWI in Brazil is currently having with groups from other left traditions. This process towards unification with IR can certainly act as a magnet to other revolutionary workers’ groups and organisations across the globe to enter into similar discussion, which the CWI will be appealing for, as part of the vital and urgent development of the forces of Trotskyism internationally. While not every section of the CWI has faced a highly favourable situation for growth over the last year, many important steps forward were referred to during the IEC. In the Irish republic three Socialist Party members were elected as TDs (members of parliament) for the Anti-Austerity Alliance in February. In Germany a member of Socialist Alternative - Lucy Redler - was in May elected onto the national committee of Die Linke - the Left Party. The ‘Outsourcing Must Fall’ campaign initiated by CWI members in South Africa developed into a rolling campaign of mass action in several cities. In November CWI members in Taiwan, following successful student campaigning and other activity, launched themselves as the group ‘International Socialist Forward’. New branches were reported by many sections - from the new Chennai branch in India (adding to branches in Pune and Bangalore), to an Aberdeen branch in Scotland (adding to those in Dundee, Glasgow, Lothian and Renfrewshire). CWI members in Northern Ireland stood the youngest candidate in the Northern Ireland elections in May, and the Italian section this year held its first national youth camp. Advances were also reported in fundraising, publications and social media reach; for example, despite a difficult objective situation, visits to the website of CWI members in Greece have more than doubled. Above all, every section of the CWI will be going into 2017 with a determination to build its membership and influence, no matter what the starting point. As stated in the IEC document on the world, the crisis of world capitalism grows ever deeper and its strategists are full of foreboding about the prospects for their system. “A constant theme is the lack of ‘legitimacy’ of capitalism: in the economic sphere, in world relations, on the issue of the environment, climate change and the reflection of this socially and politically.